It's Graduation Day! Get ready to celebrate. 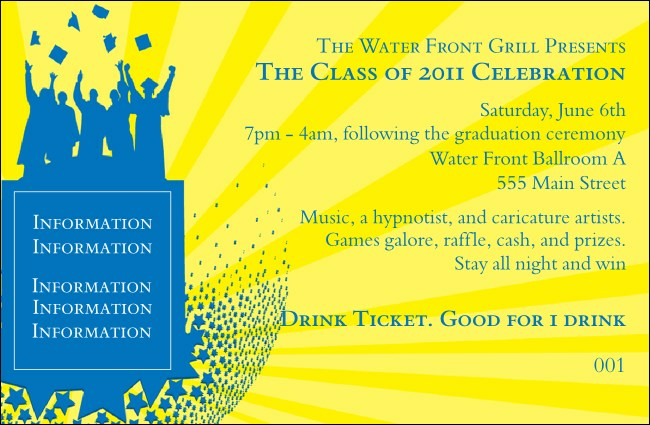 Whether you're throwing an open house for friends or getting a group of grads together, the Bright Ideas Graduation Drink Ticket will help keep all your guests from getting thirsty. Help them avoid lines with this securely numbered ticket. Fill out the easy template below and we'll do the rest! Stick with TicketPrinting.com for all the best promotional ideas!